An investment of nearly $3 billion pesos is planned in order to maintain the strict water quality controls that will preserve the cleanliness of the beaches and keep tourist satisfaction at its current high levels. David Korenfeld, Chairman of the National Water Commission (CONAGUA by its acronym in Spanish); Roberto Sandoval, Governor of the State of Nayarit and other important state and municipal representatives recently came together to announce a huge investment in a wastewater treatment plant, rainwater collection systems and storm sewers for the Riviera Nayarit. The Bay of Banderas already has its own water treatment plant; all that was needed was to connect each one of the surrounding regions. “We have carefully analyzed the region and it needs this type of long-term infrastructure; the area will continue to grow thanks to the increased revenue brought in by tourism and other activities, so having a master plan is in order,” said Korenfeld. He also indicated that Nayarit is currently searching for the raw materials to build a large treatment infrastructure. This is not simply to comply with certain standards or avoid sanctions; the facility must generate a quantifiable benefit in the recycling of water, one that reflects specifically on tourism and elevates the current standard of living. “The highest and most strict quality water treatment standards should be followed when discharging any water into the jewel that is our ocean, leading to better certified ‘clean’ beaches and higher satisfaction levels among our tourists,” said the CONAGUA Chairman. “The cost of the water treatment plant is 2.17 billion pesos, plus an additional 78 million pesos for the collection systems; this adds up to nearly 3 billion pesos that we’ll receive from CONAGUA,” said Sandoval Castañeda. This project has taken approximately a decade to come to fruition; it will ultimately benefit the population of Nayarit and the hotel infrastructure. The Governor of Nayarit asked Marc Murphy, General Director of the Convention and Visitors Bureau of the Riviera Nayarit, to inform the hoteliers of this project, which will greatly benefit tourism. 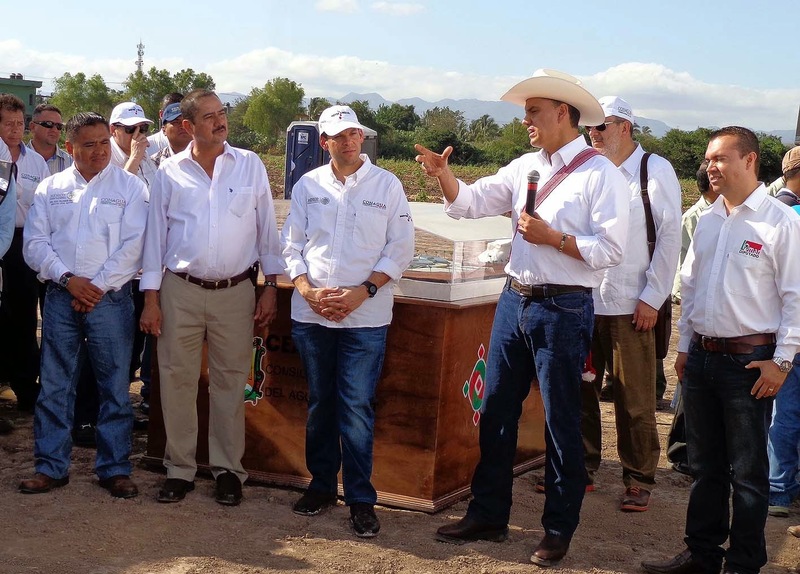 Murphy stated this has been a long awaited project and the fact that it has been put into motion will guarantee a better water supply, which will always directly and indirectly benefit the people of Nayarit.